Recognized as the most desirable address in the Columbia River Valley, this private gated community provides the discriminating owner with the very best life style imaginable. The architectural controls ensure a consistent high quality community. The waterfront homesites of course provide for fishing, swimming or boating right from your own front yard, and the Aviation lots provide the opportunity to park your airplane on your own property. All of the homesites in Phase One, Two and Three have been sold, yet the demand for this precious and rare opportunity is still strong. 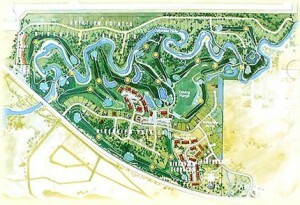 To satisfy this need, we have recently added 31 new lots of which 15 are waterfront. If you have ever dreamed of living right on a pure fresh stream with the Spectacular Rocky Mountains as your back drop, Riverside is the place you should be. Fairway & Waterfront Home Sites starting from $79,000. Please see below for strata lot numbers, sizes and layout. Riverside Golf Estates offers you an unequalled lifestyle opportunity – high quality, secure residential living in one of Canada’s finest, year-round recreational areas. The Estates surround the spectacular Riverside Golf Course, on the peaceful Columbia River minutes from Fairmont Hot Springs, Canada’s largest and finest four-season destination resort. When you choose to build your own private vacation or permanent home, you are assured of the finest in community living. The number of lots and size of the population are strictly limited and, to ensure design integrity in keeping with the development and natural environment, all home plans must be approved within the aesthetic guidelines of the Riverside Golf Estate’s Architectural Review Board. © 2019 Riverside Golf Resort. All Rights Reserved.